a (sloppy) peek at my block party quilting bee quilt. this one will be for my sons bed, so it's bigger than normal and i'm totally dreading quilting it. i really like it though! inspired by this great quilt. LOVE this top! Well done! Green is one of my favorite colors... and I think you made green proud. Love it! 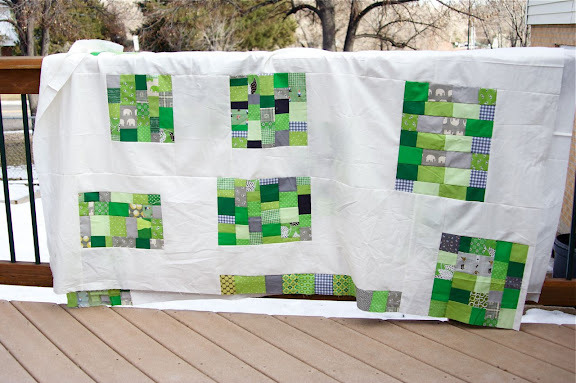 What an awesome quilt, love it, love it, especailly as I like green tooo. You did a wonderful job. Love the bright greens. I love that colour combo! I see some green thread in your future. Love the bright grassy green (with the gray) against the white. Outstanding! Oh it's looking so good!! I cannot wait to see it finished! I've been wondering about this quilt. It has such great colors and I love those map of the states blocks. It will be a great quilt! Too funny! Sloppy as you may think it is, it is really gorgeous!! so proud to be a part of this one! so fresh and springy!! Looks great! 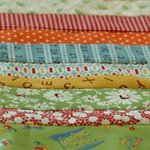 Are you going to quilt it similar to Denyse's in blocks of straight lines? I really like it! And the green and white is really nice. G'day ~ Catching up & BOY do I like that orange quilt below. Fabulous creations. good luck quilting it. I love it. What a great looking quilt! Very Gee's-Bendy! I am not familiar with what the block party thing is but this is wonderful. I love all the blocks and how they are kind of random. Nettie I love your quilts. This one is great. I love it! The greens are beautiful and I love the layout. Your son is a lucky guy! Green colors are so fresh and bright - perfect for spring! Nettie, Your son is going to love sleeping under that quilt, and he will always keep it and have the fondest memories of his mother working hard on his 'keeper'! Can't wait to see it done!